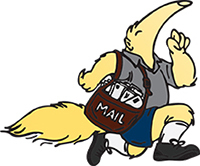 Distribution Services is the University’s hub for all incoming US mail, campus mail, and outgoing mail between the UC Irvine campus and outside postal and delivery systems. We are dedicated to the timely and efficient processing and delivery of about four million pieces of University mail per year and serve as an essential link in the flow of mail between the U.S. Postal Service and campus community. If you visit UCI Distribution Services, you will find a small staff with a lot of responsibility. 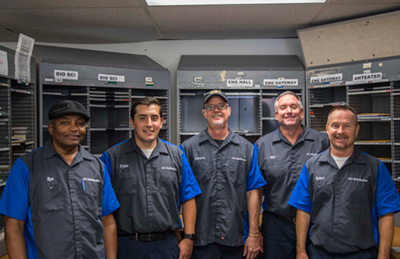 Currently, four mail clerks and one manager ensure the processing, pick up, and delivery of intra-campus mail to 230 departments. We work as a team, processing thousands of incoming letters, flats, and packages every day and mailing thousands more to people and organizations around the globe. We value timeliness, efficiency, and accuracy, and work hard every day to ensure delivery of incoming mail to the correct location.